Alāla (lit., awakening) is a point at the south end of Kailua Beach that separates Kailua Beach and Kaʻōhao (an ʻili in the Kailua ahupuaʻa – the area is now more commonly called Lanikai) on Oʻahu. In 1920, a bridge was constructed across Kaʻelepulu Stream, giving better access to the area. They laid out the subdivision and the first permanent homes in the area were constructed in 1924. Development began at the northern end of the neighborhood and moved further south along the beach. The area was initially considered a remote country location for weekend getaways or vacations at the beach for swimming, fishing, boating and hiking. The construction of the Lanikai streets was completed by October 1925. Included in the deeds for the Lanikai subdivision were restrictions that remained in effect until 1950, against building within 18-feet of the property boundary line along the street or using the property for anything other than residences. In 1926, the development doubled in size and Frazier added the now-iconic monument at the entrance to the development. The Lanikai Monument’s use of rough concrete and stone is in keeping with Wood’s experiments with natural stone indigenous to the structure’s site, an example of which is his Makiki Christian Science Church. The Lanikai Monument is a simple pillar located on a narrow strip of land that is a high point next to the road; it’s there to mark the boundary and entry point of the subdivision and golf course. It is still in its original location and its original design remains almost intact. The tapered concrete base structure is 40-feet in circumference and 56 inches high. The pillar is made of concrete and stone. During cleaning of the monument in 2001, it lost its pointed metal spear at the top, as well as the heavy chain that surrounded the monument and draped from four metal rings. 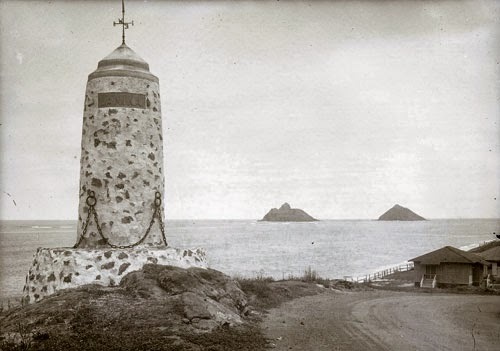 The image shows the Lanikai Monument in 1925. (gokailuamagazine) In addition, I have added other images to a folder of like name in the Photos section on my Facebook and Google+ pages. During the mid-1800s, Queen Kalama, wife of Kamehameha III, and Judge CC Harris attempted to establish a sugar plantation on the majority of lands in Kāneʻohe and Kailua. When this venture failed in 1871, Judge Harris obtained title to the lands, which he transferred to his daughter Nannie R Rice. JP Mendonca leased the lands from her and, on November 1, 1894, incorporated Kāneʻohe Ranch, for the purpose of raising cattle. A foundation herd of Aberdeen-Angus cattle formed the basis for a commercial herd of between two and three thousand head. The “wet-lands” on the property were leased to Chinese for rice cultivation. In 1907, James B Castle acquired the capital stock of Kāneʻohe Ranch Company Limited, and in 1917 his son Harold KL Castle eventually purchased the lands from Mrs Rice. The cattle industry remained an integral part of the ranch’s operations until World War II, with the herds in the early days being driven by cowboys over the Pali to be butchered in Honolulu. Military operations on the ranch lands became so extensive during World War II that the cattle industry was discontinued. Parts of the area became used by dairy farms … that leads us to the Campos clan. Rafael Campos Marfil was born in Velez, Malaga, Spain on June 30, 1860 to Antonio Gonzales Campos and Ana Robles Marfil. Campos married Maria Gallardo Claros de Macharaviaya, they had 22-children. He came to Hawaiʻi in about 1910. The newspaper was reporting on losses he suffered on his vegetable and fruit farm due to fruit flies attacking his Chile pepper. He noted, “If something is not done in regard to the fruit fly, our islands will be ruined as far as vegetables and fruits are concerned.” (Hawaiian Star, June 6, 1912) That same year, recorded transactions note he also sold cows. During the 1920s and 1930s several dairymen moved from Kapahulu to the windward side because large tracts of land had been abandoned by Libby, McNeill & Libby, following the closing of their pineapple cannery in Kahaluʻu. In the 1960s, the state had about 50 dairies; now, there are 15-farms with dairy cows and two commercial dairies licensed to sell milk — Island Dairy on the Big Island, which sells under the label Hawaii’s Fresh Milk, and Meadow Gold Dairies of Honolulu, according to a 2009 USDA report. (PBN) Mauna Moo is moving ahead with a planned dairy and cheesery. Most of our milk is now imported. Returning Hawaii to a 100% local milk supply would require an estimated 10,000 cows. 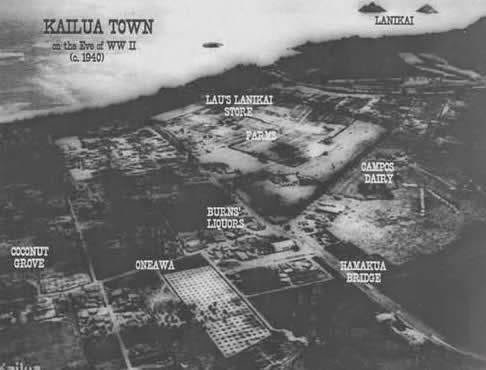 The image shows Campos Dairy lands, and other uses in Kailua in the 1940s. In addition, I have added other related images in a folder of like name in the Photos section on my Facebook and Google+ pages. A sand bar began forming across Kawainui Bay around 2,500 years ago creating Kawainui Lagoon filled with coral, fish and shellfish. The Hawaiians probably first settled along the fringes of this lagoon. Gradually, erosion of the hillsides surrounding Kawainui began to fill in the lagoon with sediments. In 1750, Kailua (two seas (probably two currents)) was the Royal Center of power for the district of Koʻolaupoko and a favored place of the O‘ahu chiefs for its abundance of fish and good canoe landings (and probably enjoyed the surf, as well.) Kawainui was once the largest cultivated freshwater fishpond on Oʻahu. Farmers grew kalo (taro) in the irrigated lo‘i along the streams from Maunawili and along the edges of the fishponds. Crops of dryland kalo, banana, sweet potato and sugarcane marked the fringes of the marsh. Fishermen harvested fish from the fishponds and the sea. In 1845 the first road was built over the Nuʻuanu Pali (cool height – cliff) to connect Windward Oʻahu with Honolulu. It was jointly financed by the government and sugar planters who wanted easy access to the fertile lands on the windward side of Oʻahu. Kamehameha III and two of his attendants were the first to cross on horseback. Lili‘uokalani wrote “Aloha ‘Oe” (farewell to thee) after an 1878 visit to an estate in Maunawili. She and her brother King David Kalākaua were regular guests and attended parties or simply came there to rest. Guests would walk between two parallel rows of royal palms, farewells would be exchanged; then, they would ride away on horseback or in their carriages. In 1939, the Oʻahu Jockey Club built the Kailua Race Track – the place was nicknamed the ‘Pineapple Derby.’ In a day and age when Seabiscuit and War Admiral were stealing continental sports headlines, more than 6,000 fans turned out for 10 races at the brand new Kailua Race Track. (Hogue, MidWeek) Races reportedly continued there into 1952. 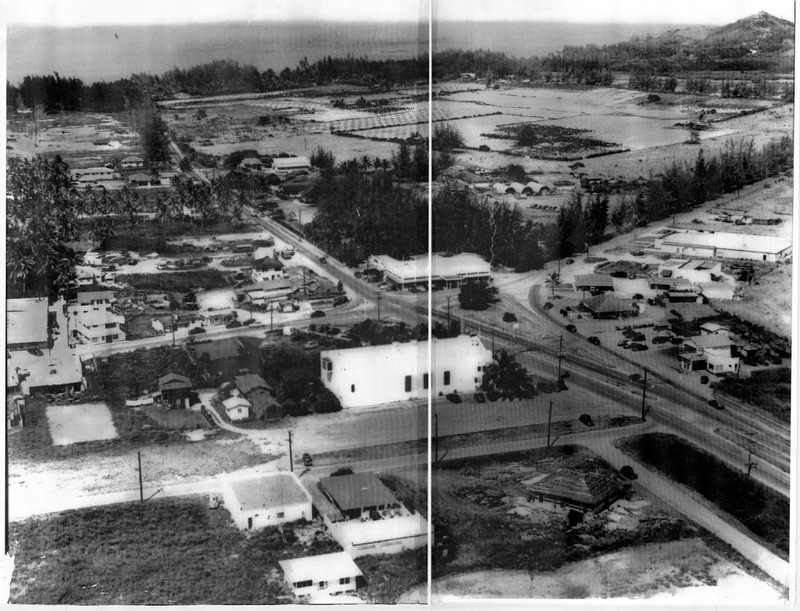 The 1950s saw expanded development and growing population in Kailua. Kāneʻohe Ranch Company, Paul Trousdale and Hawaiian Housing Corporation joined together with several housing developments, including developments in ʻAikahi (to eat all,) Kaimalino (calm or peaceful sea,) Kalāheo (the proud day,) Mōkapu (sacred district,) Olomana (forked hill) and Pōhakupu (growing rock.) (Kāneʻohe Ranch) Kailua’s population growth took a giant leap from 1,540 (in 1940,) to 7,740 (in 1950) – then another giant leap to over 25,600 people in 1960. Homes were generally priced from $9,250 to $13,500. The first increment of homes in the Kalāheo subdivision, built by QC Lum, was selling for $9,250 on lots of 7,500-square feet. The annual land lease was $125, regardless of size. Later developments in Olomana, Pōhakupu and Kūkanono (stand strike) were priced at about $17,000. (Windward Rotary) The Pali Golf Course opened in 1953. In 1956, the YMCA moved from its log cabin in Coconut Groove to the present site on Kailua Road. In 1957, Kailua High School graduated its first class. Prior to this time, mail delivery was directed to ‘Lanikai;’ at the end of the decade, the post office name was changed to Kailua. Harold KL Castle donated land and Hawaiʻi Loa College (now known as Hawaiʻi Pacific University) opened in 1962. The SH Kress building was built near Liberty House (now Macy’s) in 1962, then closed its doors after a few years, and Long’s Drug later occupied the building. In 1963, after another Castle land donation, Castle Hospital opened its doors. That year, Kailua High School moved into its own campus (its present site,) having separated from what is now only Kailua Intermediate School. In 1964, Kailua Professional Center erected the first “high-rise” (six-story) building in Kailua. It was followed shortly by the 10-story Meridian East apartment building across the street. Campos Dairy farms gave way to apartment complexes and Holiday Mart (soon to be Target) in the late-1960s. By the end of the 1970s, Kailua opened its community center with tennis courts and a swimming pool. Thaliana Hotel, later Pali Palms Hotel (1957-1980) gave way to the Pali Palms Professional Plaza. From 1960 to 1970, Kailua’s population grew from 25,600 to almost 33,800. After that, growth was comparatively slow; the 2010 Census estimate Kailua’s population at just over 38,600. The image shows Kailua in 1937 – Kailua-Kuʻulei-Oneawa intersection (note small banyan tree in island where Kailua Road turns to the right (Machado.)) (Lots of information here from Kāneʻohe Ranch and Windward Rotary historical summaries.) In addition, I have included other related images in a folder of like name in the Photos section on my Facebook and Google+ pages. The place name “Kailua” means “two seas,” according to Pukui et al, which may refer to the presence of two currents, although some have suggested that use of this Oʻahu place name refers to the two inland ponds, Kawainui and Kaʻelepulu. The earliest settlement of the Kailua area may date back to between 1,000 and 1,500 years ago; by the 15th and 16th centuries, the makai portion of Kailua had become a favorite settlement locale of chiefs. Traditional history describes Kailua as the residence of many prominent O‘ahu ruling chiefs. There is ‘Olopana, “who with his brother Kahiki‘ula came to O‘ahu from Kahiki … He is said to have established several heiau in Kāne‘ohe and Kailua”. One of the earliest great chiefs to reside in Kailua was the 16th-century ruler Kakuhihewa, who built himself a great house at ‘Ālele in Kailua. At approximately the same time, another prominent chief, Kuali‘i, born at Kalapawai, Kailua and raised in Kualoa and Kailua, had his navel-cutting ceremony at the heiau of Alāla (present-day Lanikai Point); and, after heroically succeeding in many battles, became the high chief of O‘ahu. In early historic times, the conquering chief Kahekili, followed by Kamehameha I, resided in Kailua for a time. There are legendary accounts of the prominent Mount Olomana, which is named after a great mythological giant and/or chief. She ensured that all the people of the ahupua‘a shared in the pond’s wealth but punished those who were greedy. Oral history notes that the stones overlooking Kawainui on Pu‘u o ‘Ehu are sacred to Hauwahine and her companion. This interpretation is connected to the ancient Hawaiian notion that the channel/canal beneath Pu‘u o ‘Ehu connects Kawainui and Ka‘elepulu. Kawainui Marsh was considered male, and Ka‘elepulu Pond, female. They mated at Kawailoa, according to Hawaiian tradition. Mele and oli about Kailua frequently mention the two fishponds, which were famous for their ‘ama‘ama (mullet) and awa (milkfish). They also praise the taro gardens of the area. A few of these chants and legends are those of Hi‘iaka, Kahinihini‘ula, the Mākālei Tree and Ka‘ulu. The famous mythological tree, Mākālei, had the power of attracting fish. Moʻo purportedly lived in her grove of awa by the Mākālei tree near where the waters drain from Kawainui Marsh to Hāmākua. Hauwahine’s companion moʻo, named Kilioe, lived at the opposite end of Hāmākua near where Kawainui Stream enters Ka’elepulu Stream. Nā Pōhaku o Hauwahine is the given name of a 12-acre piece of state property under the Department of Land and Natural Resources (DLNR), Division of State Parks and part of the Kawainui State Park Reserve. 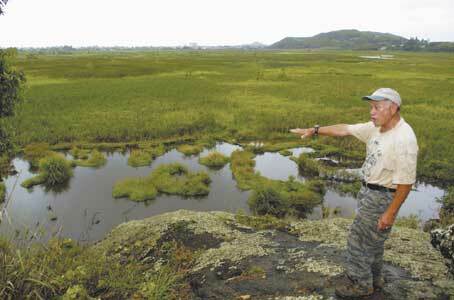 The parcel is located along Kapa‘a Quarry Road in Kailua (O‘ahu) overlooking Kawainui Marsh. ‘Ahahui Malama i ka Lokahi is the curator for this sacred site. Over the years, the group has been planting the 12-acres with native plants to recreate a dryland forest ecosystem. Brush removal and trail construction has revealed ancient Hawaiian terraces that align the massive rock outcrops. Image shows Doc Burrows at Nā Pōhaku o Hauwahine, overlooking Kawainui Marsh. (Much of the information here is from reporting by Cultural Surveys Hawaiʻi.) I have added more images to a folder of like name in the Photos section on my Facebook and Google+ pages.